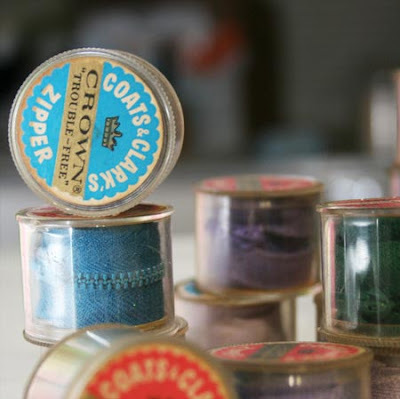 We gather a lot of vintage sewing items at Vintage Vixen. Everything from buttons and snaps to trim and zippers is fair game. There's a perpetual need here for vintage notions like these, as we repair many of the vintage clothes we sell. When our buyer Pat came across these zippers, though, we had to take a second look. Pat's had a great nose for interesting little things for decades, and I'd never seen zippers in "cans" before. 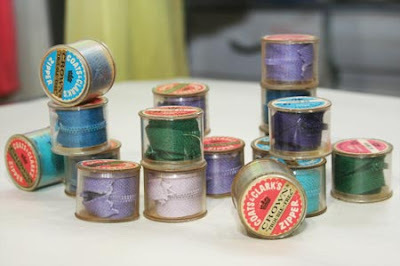 Apparently Coats & Clark's decided little clear plastic containers were an eye-catching way to sell their zippers in the 1960s. Not only do the vintage graphics and plastic styling tell us the age, but also the colors. There are lots of sherbet hues and colorful brights, primarily in oranges, greens, blues and purples. The color names are singularly vintage, too. There are classics like hunter and lilac, along with quaint hues like ciel (pale powder blue) and parakeet (bold turquoise). 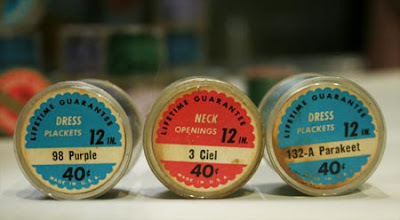 If you go to a sewing shop today, you might find equivalent colors but not identical containers like these. 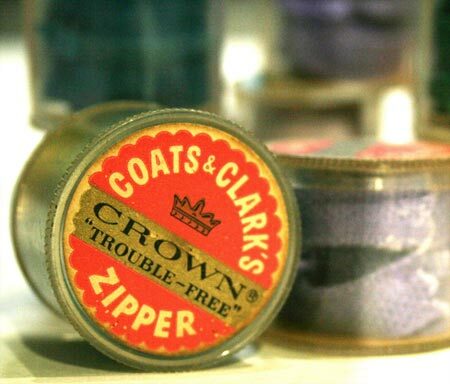 Coats & Clark's must have decided these fun little jars weren't the best solution for packaging zippers after all, but they certainly are fun!